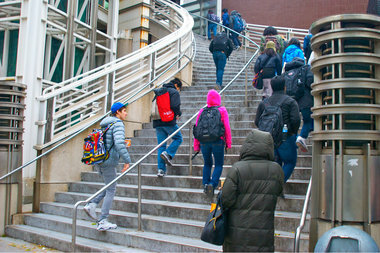 Students head up the stairs for class at Stuyvesant High School. The Department of Education would be required to submit an annual report on diversity under a package of legislation introduced Wednesday by the City Council. A resolution also calls for the New York State Legislature to pass a bill that would change the single test admission criteria for the city's specialized high schools. CITY HALL — The Department of Education would be required to change the city's specialized high schools admissions criteria and submit an annual report on diversity in city schools under a package of legislation introduced Wednesday by the City Council. One resolution calls for the state legislature to pass a bill that would change the single test admission criteria for the city's specialized high schools and instead use several criteria such as grades and letters of recommendation. In addition, a second resolution calls for the DOE to prioritize diversity in making decisions regarding everything from admission practices to the creation of new schools. The package of legislation comes after a recent report from the Civil Rights Project at the University of California at Los Angeles found that New York state has the most segregated schools in the country. According to the report, 19 of 32 school districts in the city had less than 10 percent white students. When it came to charter schools, 73 percent had less than 1 percent of white students. The report also found that racially isolated schools also had a higher percentage of low-income students, meaning that attendees were segregated not just by race but also class. "In the city where we see diversity as an asset, our schools have the worst diversity of all," said Brooklyn Councilman Brad Lander, one of the primary sponsors of the legislative package, along with council members Inez Barron of Brooklyn and Ritchie Torres of the Bronx. The Civil Rights Project report said that much of the school segregation is due to high rates of residential segregation but that there were no "significant desegregation plans" in place to deal with the issue. Lander said that's one one of the reasons for introducing the legislation. "We have a problem and we have to look it in the eye and address it," said Lander. Addressing diversity at the city's specialized high schools that serve gifted students can happen by changing the admission requirements from just a single test, said Queens Councilman Daniel Dromm, a former educator and co-sponsor of the legislative package. "One test does not fit all," Dromm said during an interview in the council chambers. "You should have multiple means of evaluating students." Eight of nine specialized high schools rely on the test as the sole criteria for admission. But critics of the suggested changes to the specialized high schools admissions — which include Stuyvesant High School alum and Queens Congresswoman Grace Meng — have been staunchly opposed to any movement. Mayor Bill de Blasio has also said he would like to see the single test admissions policy changed. Asked about the package of legislation, the DOE said it "recognize[s] the critical value that a diverse student body brings to our schools," according to DOE spokeswoman Devora Kaye. “We are exploring additional ways to reflect this diversity in every zip code, and look forward to reviewing the package of legislation," added Kaye. The City Council will hold a hearing on the issue of improving school diversity in November.